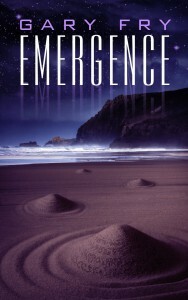 I originally gave Gary Fry's Emergence four stars, but after a day or so of the story simmering in my thoughts, going over some of the themes, I had to move up to five stars. I even moved it into my favorites. Every time I think about Emergence, the more I like it. Is Emergence a perfect story? No. It's not. No story is. Emergence is a slow burn with an ambiguous ending that I know will leave a bad taste in some people mouths. But not mine. For me, the characters and, as mentioned, the themes touched me very deeply. Jack, who has just lost his wife, and his grandson are spending the week together in his house on the coast of northeast England. Both are experiencing similar problems with reading. Jack, who was an English teacher, is now having difficulty identifying words, while Paul, the grandson, is just learning to read and therefore suffers similar problems. They wake up one morning to find a series cones that have been carved out on the beach sand. And the morning after that, an entire city. What these have in common with the stumbling blocks of communication you will have to read for yourself. The fear of getting old, however, that existential horror of realization that your body will one day fail, perhaps is failing, is a fascination (more of a dark obsession) of mine. It kept me focused on not just where the story was taking me, but Jack's awesome characterization. What we have here is a story of existential and cosmic horror that can be read easily in one sitting. Very well written. If you like the weird fiction of the early twentieth century with a modern sense of culture, then this story should be right up your alley. It certainly was mine. Highly recommended. I'm looking forward to reading more by this author.